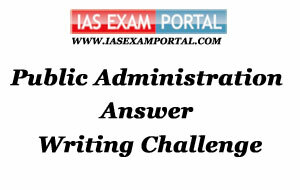 Weekly Mains Exam 2016 Answer Writing Challenge - Public Administration "MODULE- 35" | IAS EXAM PORTAL - India's Largest Community for UPSC Exam Aspirants. Weekly Mains Exam 2016 Answer Writing Challenge - Public Administration "MODULE- 35"
Q1. British philosophy of Administration is based on integration of science of Administration with ethics. Discuss 20 Marks. Q2. Ethics in public services has been the central concern for debate. Critically examine the statement 20 Marks.